At the University of Maine School of Law, Dan was a Member and Editor of the Maine Law Review. After graduating from law school in 1989, he was the Law Clerk for two years for the Honorable James A. Goodman, United States Bankruptcy Court, District of Maine, during which time he was also assigned to the Southern District of New York. He has been involved in one form or another with most of the significant bankruptcy proceedings in Maine in the last two decade. Dan maintains a regular creditors' rights and collection practice for large and small commercial clients and banks, though he also represents debtors in and out of bankruptcy court. 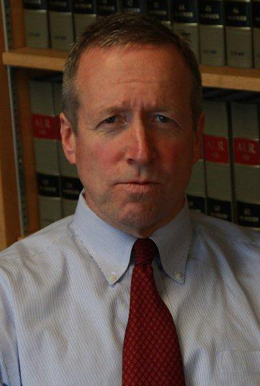 His labor law practice has led him to work on some of the leading cases involving public employer/employee disputes in Maine in recent years. Dan represents various collective bargaining units, including the Maine State Troopers Association, the Maine Association of Police, the Maine State Law Enforcement Association, and Maine Employees United. Dan regularly participates in seminars on varied legal subjects for the bar, the general public and his clients. Dan was born in Worcester, Massachusetts and has resided in Maine since 1986. He lives outside of Portland with his wife Kelli and their three children. Though most of his spare time has been spent tending to his children, he also enjoys reading, music, cinema and he participates in several sports.